พลาดจากเป้าที่วางไว้ 30,000 คน/วัน ทำให้ขาดทุนถึง 1,000 ลบ. เนื่องจาก กทม. ต้องควักเนื้อ งบประมาณอุดหนุนโครงการ ปีล่ะ 200 กว่าลบ. Japan is keeping an entire train station open for just one passenger. Kana Harada lives in Shirataki, a neighborhood with just 36 people. 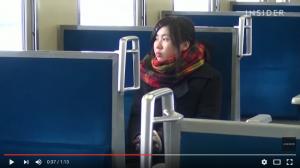 She takes the train every day to the closest high school, 35 minutes away. And She’s the only one who gets on. Local residents build the station in 1955 to get kids to school. When Harada graduates in March, the station will shut down. Harada is proud to be the train’s last passenger.